The savoury dumplings, stuffed with potatoes, cabbages or paneer, are an essential part of Russian cuisine and relatively easy to cook. In just about every culinary tradition, there are dishes made of dough and stuffed with various fillings. Chinese Dim Sum, Italian Ravioli, Tibetan Momos, Georgian Khinkalis and Polish Pirogis are few examples. 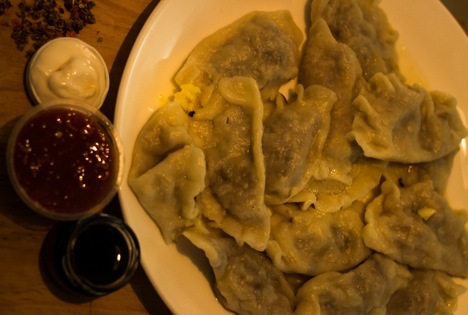 The Russian kitchen also has its own variants of dumplings, the most famous being Vareniki, Pelmeni and Manti. I would like to start a series of recipes, sharing the unique way Russians make these dishes with step-by-step instructions of making the dish. Our first encounter is Vareniki, a very popular dish in Russia and made mostly with vegetarian stuffing. Its origin can be traced back to Ukraine, where it is considered a national dish along with Borsch. But a glimpse into the history would reveal that the dish originated from Turkey, where it was called “dyush-vara”. Even though Ukrainians didn’t particularly admire the Turks, they fell in love with the dish. In the beginning it was called “vara-niki” later the name transformed to “Vareniki” (that could also mean something boiled/cooked). In Ukraine it is common to have stuffing made of pork fat (Ukrainians love pork fat! ), while in Russia the common stuffing is made of potato, mushrooms, cabbage, cottage cheese or cherries. We (Russians) make non-vegetarian dumplings in the shape of pelmeni and manti not vareniki. The size is also much bigger than pelmeni and smaller than manti. If you ask Ukranians, they will say that vareniki should be sweet. I prefer the savory options. 1. Sift maida to get rid of any solid particles or bugs and make it more loose and airy. 2. Put maida in a large bowl and make a hole in the middle. Add pinch of salt and chilled water and thoroughly mix. The dough doesn't need to be perfect but you have to rest it. It has to be very tight; much tighter than for chappati. You will have to leave it to rest at least for half an hour covered with cling wrap or dump cloth. (In the picture you can see the dough before resting). 4. Cut them into medallions, sprinkle maida and roll into flat rounds 3 inch in diameter. If the dough sticks to the rolling pin, add more maida on the pin or rolling board. Once you get your hands on it, the process will go very fast. 5. While your dough was resting, prepare the stuffing. Boil the potatoes and mash them in a rough manner. Fry chopped onion in butter till golden brown. If you decide to add mushrooms, cut them into cubes and fry it along with onion. Prepare the mixture by mixing all the ingredients and seasoning it with salt, pepper, herbs or masala. 6. Use a tea spoon to put stuffing on each round of dough. Fold it into half to cover the filling, clip both the sides together with your fingers. If there is too much maida, you might need to put water on your fingers to stick the dough together. You have to put gentle pressure while sticking so your dumplings will not fall apart when you will be boiling them. Ready vareniki put on flat tray or directly on the table sprinkled with maid so they don’t stick. 7. The final shape of these dumplings is shown on the picture. Bring enough water to boil (at least three times more than the amount of dumplings you are boiling). There should be enough room in the pot to properly boil the vareniki. Once you bring water to boil, add 1/2 table spoon of salt and boil vareniki. It will take only 5-7 minutes to get them cooked. The rule of thumb is when vareniki float to the top of the water, they are ready. But please check one but taking it out and cutting; the dough should be thoroughly cooked everywhere. Drain water and add generous piece of butter. Serve vareniki with set curd or any other sauce of your choice. 1. Freshly made paneer mixed with egg yolk and sugar.